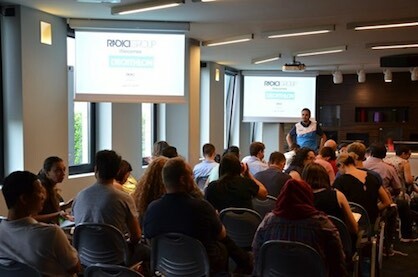 An exchange of experiences in the light of sustainability: this is how it is possible to qualify the gathering together of sixty Decathlon workers from all over the world who visited RadiciGroup Headquarters along with two production plants. After a morning session "in the classroom" the delegation moved to the production sites of Villa d'Ogna (Bergamo) and was able to see how polymerization of nylon 6, yarn processing, and engineering plastics manufacturing occur. The Decathlon sustainability team is currently spending a "sustainability week" in Italy, focusing on issues such as circular economy, eco-design, products with low environmental impact and renewable energy. This is a traditional annual meeting for Decathlon people who deal with these topics around the world. Every year the meeting location changes and this year Decathlon has chosen Italy for the “field training” of its team. In this context, the visit to RadiciGroup responds to the need to exchange views with a manufacturer of innovative and sustainable products targeted at numerous sectors, among which sports: from nylon to polyester fibres, from synthetic grass yarns to engineering plastics used for manufacturing different accessories. «We are very pleased - said Marco De Silvestri, marketing director of RadiciGroup Comfort Fibres Business Area - that an important company like Decathlon is highly focused on sustainability and has decided to visit us. RadiciGroup has made sustainability a company strategy since long and today, thanks to the numerous investments aimed at reducing the environmental impact of its production activities, the Group achieved excellent results, reported and certified in its Sustainability Report. Our meeting today - concludes De Silvestri - demonstrates once again how sustainability should be planned and experienced throughout the supply chain, from the producer of raw materials to the large retailer, to reach a consumer who, let's not forget this, is increasingly informed and aware».